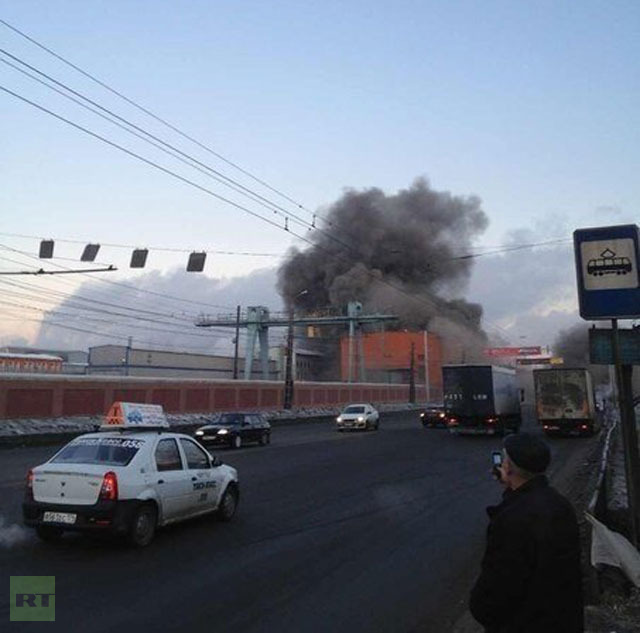 DTFizzix Science News: Russian Meteor Impacts CONFIRMED! This is a startling reminder that "Space Is a Dangerous Place"! Above image is a confirmed meteorite strike. This is, according to the Russian Interior Miisistry, the hole bored into a frozen lake just out of town. Small black “fragments” measuring 1-cm of “black matter”, not to be confused with Dark Matter, were found spread around the impact site. 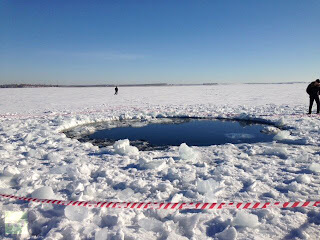 There is apparently another hole in the ice of the same lake and one small crater found 80-km northwest of Chebarkul. 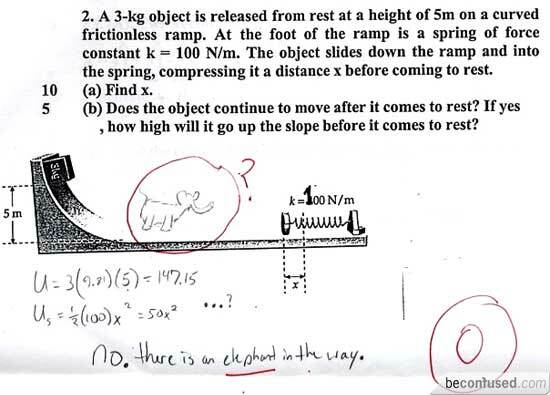 This is too cool! Reports also state that a zinc factory in town was struck by a fragment and collapsed. Images are not conclusive and investigators are searching the rubble as I type. Before you buy into most of the media hype/errors, here is what we know at this point about the Russian Meteor of 02/15/2013. [IMAGE: Dashcam image from Universe Today Online] First, the words. A meteoroid is a small-ish rock that happens to be “floating” around in space. They are all over the solar system; floating around like a huge swarm of gnats. Most are sand-grain to large boulder sized rocks. During a typical meteor shower, as I wrote about the December 2012 Geminids extensively, are just “clouds” of sand-grain sized pieces of dirt and ice left over from comet passes. However, some meteoroids, like this one, are large. Not nearly as large as the asteroid 2012 DA14 that will pass close to the earth later today. As I also wrote about this asteroid previously, 2012 DA14 is about 50 meters wide and ‘weighs’ in at a staggering 190,000 metric tons (tonnes)! If an asteroid this size hits the earth, it would more than ruin your day… This Russian meteoroid is estimated at 8 tonnes. Most if it burned up in the atmosphere as witnessed in the above image from Universe Today. Note the “split trail”. This indicates the meteoroid broke into at least two pieces then further disintegrated from there. The telltale light trail left behind by a meteoroid streaking through the atmosphere is called a meteor. This is what is commonly and erroneously referred to as a “shooting” or “falling star”. These have nothing to do with stars. Nothing. If this meteoroid survives the trip through the atmosphere and lands on the surface, it is then called a meteorite. Rest assured, there will be troops of meteor hunters scouring the Russian landscape searching for surviving meteorites. The above is an amateur shot of the zinc factory downtown that media, particularly FOX, is claiming got hit by the meteorite. NOT CONFIRMED! 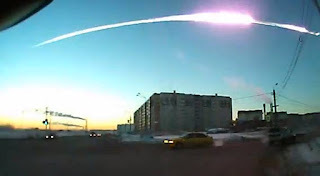 It is more likely the building was damaged by the huge shock wave (sonic boom) from the passage of the meteor as seen in so many other videos online. YouTube is full of videos showing windows and doors and even garage doors being blown out from the sonic boom. 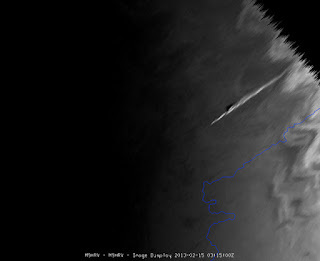 Meteor streak as seen from Weather satellite Meteosat 10 has taken an image of the meteorite shortly after entering the atmosphere. (Copyright 2013 © EUMETSAT) So, stay tuned! This should be interesting!